Vogue is one of the great institutions of the fashion world. For as long as we can remember, Vogue has been a bye word for "style" the world over. In the fashion world, to be accepted by Vogue is like winning the golden ticket to success and for a model, a Vogue cover is the pinnacle to aim for. The recent cover featuring Kayne West and Kim Kardashian, shown on the right, raised more than a few eyebrows and comments. But "why" is this cover being talked about so much? The decision by Anna Wintour, Vogue editor in chief, to give Kim and Kayne the cover has upset many fans of the style magazine but there are some who give wholehearted support. Celebrity stylist Rachel Zoe gave her endorsement while attending an event in Los Angeles last Saturday. But not everybody agrees. One of the most outspoken critics has been Sarah Michelle Gellar who tweeted "Well.....I guess I'm canceling my Vogue subscription. Who is with me???" As you would expect, Sarah Michelle had many supporters. Traditionally, Vogue has been viewed as the pinnacle of a modeling career, almost like a "model heaven". Most models work very hard and dream of a Vogue cover. There are limited opportunities for hard working models to achieve this goal so it does seem unfair to give such a valuable space to celebrities instead of to professional models. 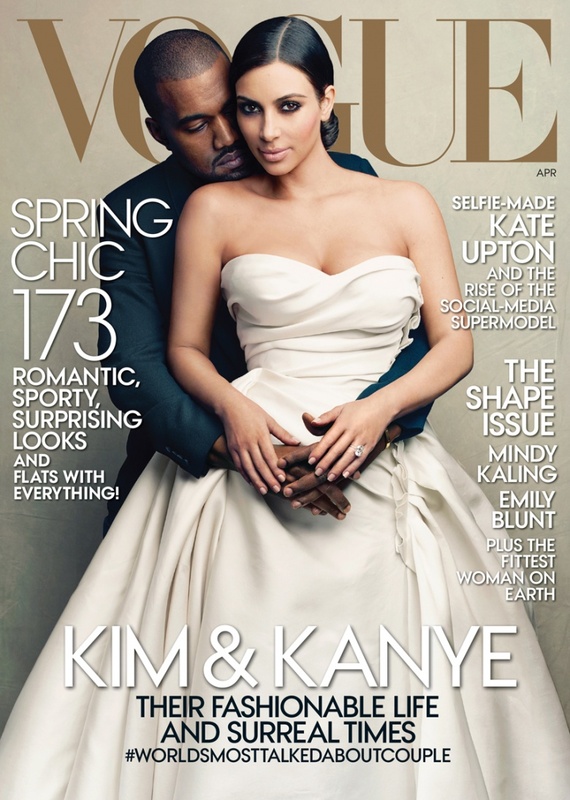 However, there are those who say that putting Kim and Kayne on the cover will introduce a new younger audience. 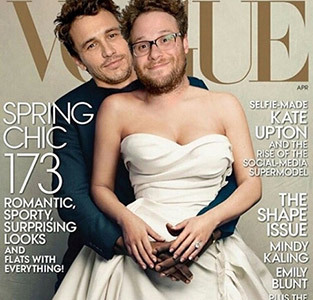 It's clear that some readers are not happy but will they stop buying Vogue because of it? We doubt it! The reality is that for many years now, Vogue has been moving slowly towards more celebrity driven content and while this new cover is something of a surprise, it really shouldn't be. After all, if we take a look back a few years, previous Vogue covers included Britney Spears and The Spice Girls. I must admit that I loved Naoimi Campbell's reactions when asked about "that cover" - click here to see it for yourself. We have always considered Naoimi to be a class act and as this clip proves, as well as having an infectious laugh, she's very astute with her "politically correct" reply "they're your words, not mine". Priceless! And for professional models, she makes a valid point. The Kim and Kayne Vogue spread was shot by Annie Leibovitz, a legendary photographer responsible for some of the most stunning Vanity Fair covers as well as iconic shoots for Rolling Stone magazine and music legends like John Lennon. No matter which side of the argument you're on, it's invaluable publicity for one of the most established publications in the world. In the words of our one time neighbour Oscar Wilde, "The only thing worse than being talked about, is not being talked about". Anyone prepared to guess how many copies this issue will sell? Yes this has generated a lot of debate and let's face it, there are more important issues in the world. So to finish on a ligther note, we enjoyed some of the Kim and Kayne "spoof" covers that have surfaced. All in good fun we think. 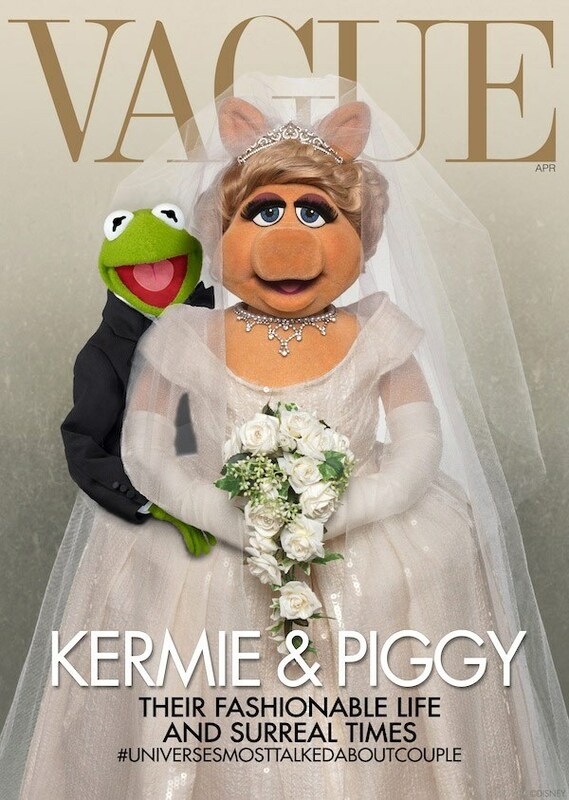 James Franco and Seth Rogan spoof was excellent but our favourite has to be our hero Kermit with the stunning Miss Piggy. Our only disappointment was that Miss Piggy wasn't wearing a Laila Monroe Wedding Dress. But we still love her!